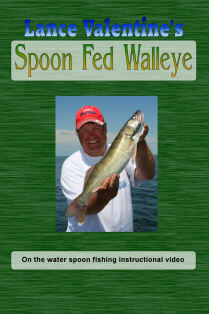 This "How To For Walleye" Series DVD will teach you a variety of techniques for properly fishing spoons for walleye. Learn about spoon selection, diving discs, jet divers, boat speed, and much more. Spoons are a deadly walleye presentation when properly run. Learn the secrets to catching more and bigger walleye by adding spoon fishing to your arsenal. Join Lance for 60 minutes of on water action and put his favorite techniques to work on your favorite lake this summer! Lance Valentine's Walleye 101 Inc.